Me...Carolyn...with a great knitted model! As said in last post….Karen and I crossed the aisle into Great Yarns! I think it was at this “crossing” that two women approached me and asked about the design I was wearing. At my retail shop Sandy Lee nicknamed it “The Donut” and to this day if you say that name my knitting circle knows exactly what design that is. In fact, it is the “Round Shawl” from Sally Melville‘s Knit Stitch Book. I have three renditions of this design….and the one I wore on this past Saturday is my favorite…rather rustic and most comfortable to wear! I knit it with Noro’s discontinued Shinano. What was so amazing about my wearing this was that I was complimented throughout the day. 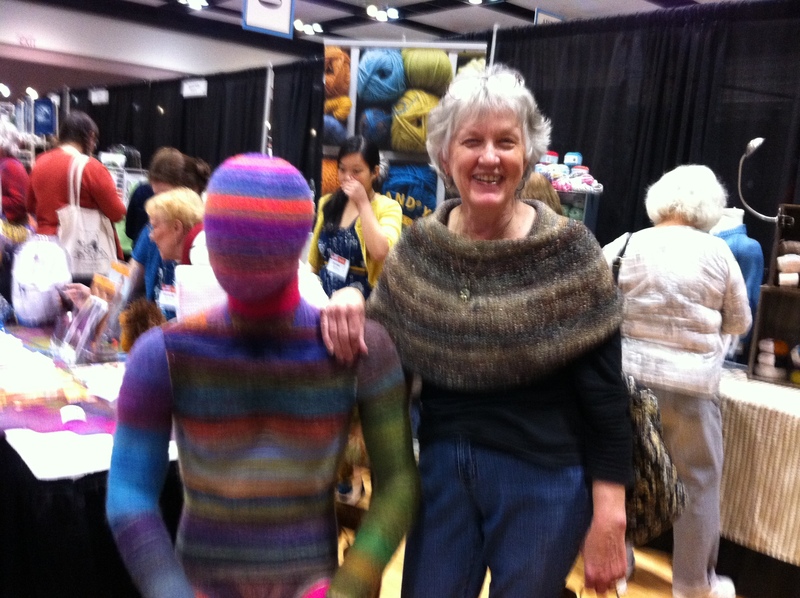 I was approached by the two ladies again….they said were stalking me….they just had to learn more about this shawl. We met up at least one more time before the day was over for Karen and me. The day ended with yet another compliment….”Ma’am” ….I thought I had dropped something. She said, “I just want to ask you about your shawl..the pattern?? the yarn? ?” I’ve never worn something to Stitches before that has received so many compliments. Thank you to Sally Melville for the design…simple but yet so fun to knit and wear! Now….notice my companion in this photo. Is that not a great model? This was found in Lion Brand Yarn Studio and I just had to hang out with this model for a moment or two. 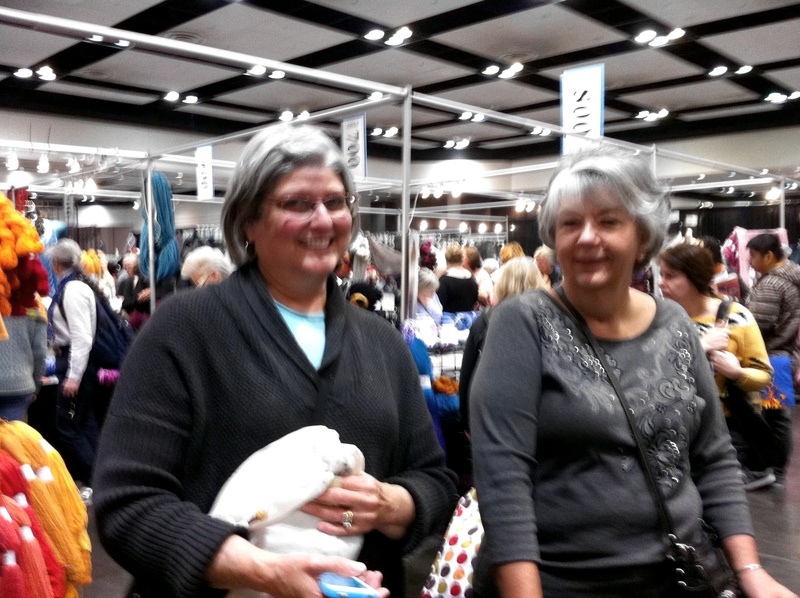 Here are my “stalkers”…they were sharing that one of them had just bought yarn for “The Round Shawl aka Donut” and wanted to know what I thought! What a great compliment…I was so flattered! Now…off for a couple of days to a young people treat….I am one of the leaders…I will post about that later. There is much more to share about the Stitches adventure….I’ll be back with two or three more posts…it’s all about sharing the knitting journey.